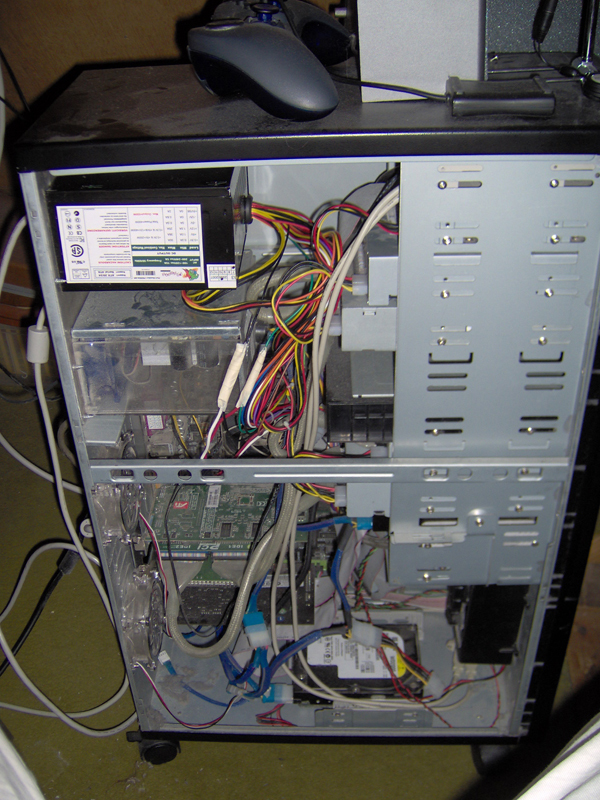 This guide will explain how to have two power supplies turn on and off together while attached to one motherboard. This will require some very simple wiring, and as such some basic tools and supplies are needed. Iâ€™d like to say that I started this guide because Iâ€™ve just recently replaced my secondary PSU after it died of old age. It went peacefully into the night. Hereâ€™s a shot comparing the two. - the one that died was a 400w PSU that is a bit over 3 years. The new one with the nice black finish is 550w. And while I donâ€™t need as much power since Iâ€™m running two PSUâ€™s this one was at an awfully nice price. The first task is to locate the 14th wire, this will be the only Green wire on the P1 connector (the one that powers the motherboard). Then along with any black wire since we need a ground, cut them in half at about the same lengths. Once that is done, strip the ends, leaving around a half inch. Now take your molex connector, matching which side will connect to the ground and which to the power, give them a quick twist. Before you fix the other end of the ground and power, slide about an inch length of heatshrink over the ground and power wires. Now find the other side of the corresponding wires and twist them all together. Now slide the heatshrink over the bare spots in the wiring. To affix it, many people use a lighter, if you do this, just be careful not to singe the heatshrink. I ended up using a heat gun which is for the most part an over-glorified hair dryer, but I wont have to worry about singing anything with it. Once you repeat this process with your other power supply your ready to roll. Because we wired them this way, once your two power supplies are connected together either one can be the primary one. All you have to do is plug the P1 connector into the mother board and BAM, your set. - This is the custom back panel I made to mount the second PSU, not to big on appearances but I can deal with that. - And finally this is a good reason to have a second PSU. 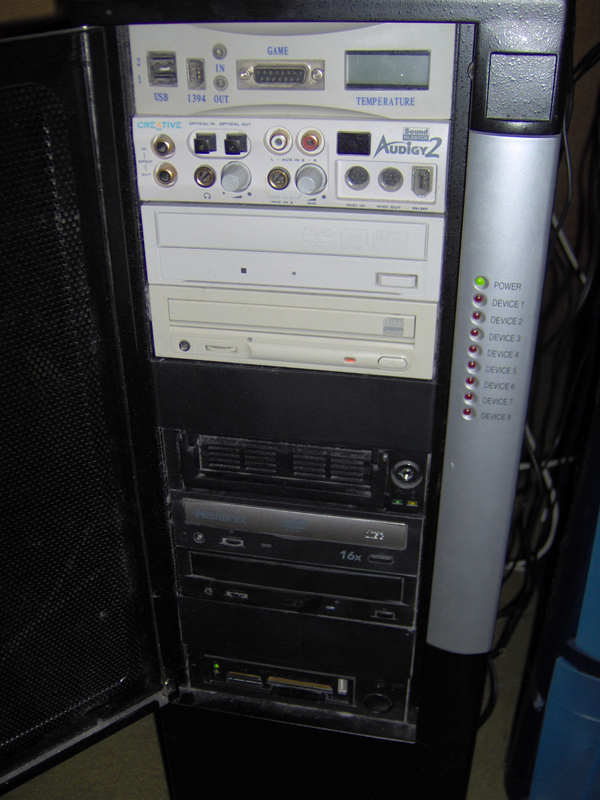 I have 4 CD-Roms and two hard drives in there. * A good practice on Dual PSUâ€™s is to have one power all the critical components, MOBO, Harddrives, and the other all the seconday components like CD-Roms, Floppy, Ect. Now of course youâ€™ll want to balance the consumption between them, but this is just a suggestion in the event that one does die one day, it shouldnâ€™t do any real damage by shutting off. ** And on a final note, if you want to make a great test PSU with a hard on/off like the old AT ones, just put a jumper in pin 14 (the green wire), and connect it to any ground. Once you do this, the power button on the back of the PSU will function as the on/off switch. I hope you all found this worth while, question or comments are always welcomed. nice guide! one thing i dont understand however is what happends with the molex-ed power signal wires? do you attach it to a molex on the primary PSU, or do you attach them both to a switch on the front of the case? other than that, nice work, and some good pics too! i didn't realize it when i made this guide that i never got a good pic of the molex connectors connecting the two PSUs together. In this pic you can see one of the connectors pretty well. Its made so it can connect to the other molex in only one way that the wires corespond with their respepective wires. What i did was i ran the PS &#34;ON&#34; wire and a ground together through these. This way when you hit the power button your PC and your PC sends the on command to the PSU, this sends the signal to both PSUs so they will turn on and off together. Also if you wanted to take those two wires and connect a rocker switch, you would have a nice test PSU on hand. Nice guide. I might have to try this if i get a new case. I can make a worklog if you want to, if there isn't anything written yet? I always thought red was +5 volt and orange was 3.3v but maybe i am wrong. Instead of melting heat shrink away, isn't it easier to cut the wire, and cut the shrink away, then wrap it together and wrap in tape? Think about it: you need no lighter, no heat gun, no solder, no soldering gun, no shrink wrap. All you need is a knife and fingers. then wrap it together and wrap in tape? That is a bad habit to start. It is not a secure connection. It is more prone to corrosion. It is easily pulled apart. If for some reason that line was to be overloaded it could come undone, or melt the tape off and arch with something causing far greater problems. It is just a plain bad idea to handle electronics this way.